Poor baby! I used to have a pug (she's still alive but belongs to my ex, sad) and she had an epic tooth problem, somehow her mouth started rejecting her teeth and she ended up with a systemic infection and almost died! Those pug mouths, no matter how much you brush it's like a little tooth decay factory. Glad to hear Oliver is doing well, and enjoy those extra snuggles!! Poor little boy! I can totally relate to how you feel. I cried like a baby the last time Doug had to get a tooth extracted-- I didn't want to leave him at the vet's. But it's better to take care of any tooth issues right away so they don't get worse. 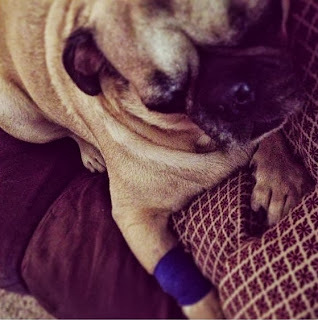 It's so hard to keep pugs healthy all the time-- we're super vigilant with our little dudes, but they've got lots of little health challenges. I took my Boston Terrier Cuchita to vet for cleaning the first time. She was groggy for one day, but the only bad thing was a great bruise where she got the anesthesia. Thank God her mouth was pretty healthy!. Take good care of poor Oliver, give him a hug for me! My little lurcher Milly has an appointment at the (whispers) "vets" on Tuesday for her teeth cleaned, hopefully thats all. Dreading it. Hope Oliver is back to his usual self soon. Poor Oliver, so sorry for him! Our dog has damaged a tooth and looks like he'll have to have it out. I'm a very over anxious 'mom' so I'll probably be camping outside the vets! Hope Oliver feels better soon! Ahh poor Oliver! I hope he's doing better the day after surgery.. I can only imagine how awfull it is to leave your baby at the vet.. The only thing I can say, being a vet myself, is that they're well loved the moments they're with us aswell! Also I hope his allergies improve, is the diet helping? I'm loving your patterns by the way, I've been waiting for my first pay check so I can treat myself to 2 of them!